Totem poles outside Burke Museum of Natural History and Culture, University of Washington, Seattle, Washington. These are 20th century replicas of 19th century totem poles. 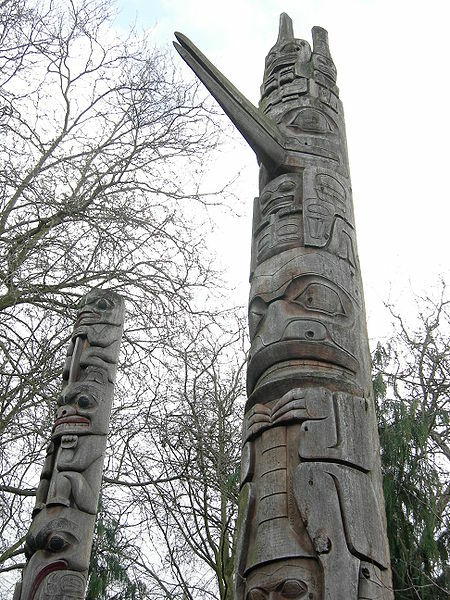 The pole on the left is a Tsimshian memorial pole (original carved circa 1880, replica carved 1970 by Bill Holm). The pole on the right is a Haida house front pole (original carved circa 1870, replica carved 1969 by Bill Holm). GFDL granted by photographer. I believe the poles themselves should be PD, since they are faithful replicas of 19th-century works of art.